Autumn is peak time for ordering your bulbs. Take a few minutes to review bulb catalogs and plan for your first splash of spring color. There are numerous bulbs catalogs loaded with breathtaking photos and ideas. A word of caution: those flashy tulips are stunning but purchase them sparingly. Many of these showstoppers don’t have the longevity as they often fall victim to the occasional woodchucks, voles or deer. For large bulbs, daffodils are a perfect choice. These bulbs grow for years, expanding in size and can be easily divided and spread much like herbaceous perennials. Plant them amongst your day lilies to wake up your border. As the daffodils pass, the lilies cover up the faded leaves. For low-growing groundcover types, Scilla, Chionodoxa and Grape Hyacinths are dynamite, low-growing bulbs that seed themselves all over the garden, creating stunning drifts of color. Crocuses are also a tried and true; there are lots of colors and sizes to choose from, adding delicate flowers to the mix. Don’t forget your fall blooming bulbs. 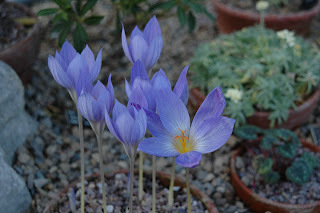 Crocus sativus (Saffron Crocus) is one to consider; how can you go wrong when there is saffron in its name? Selecting tried and true species for the bulk of your order is my best advice for naturalizing and spread capability. Get the most impact from your purchase. Don’t forget where your bulbs are located as October is prime month to divide your bulbs.